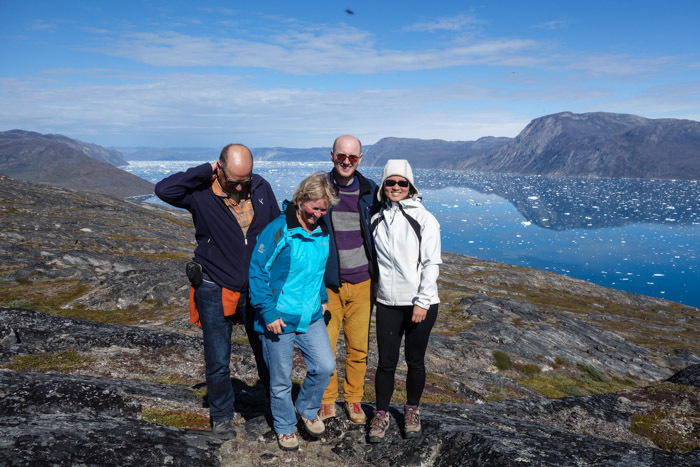 We sailed in an open boat past icebergs, hiked up to see the beginning of the inland ice, stuffed ourselves with blueberries and ended with a delicious kaffemik at a local’s home at Kapisillit. 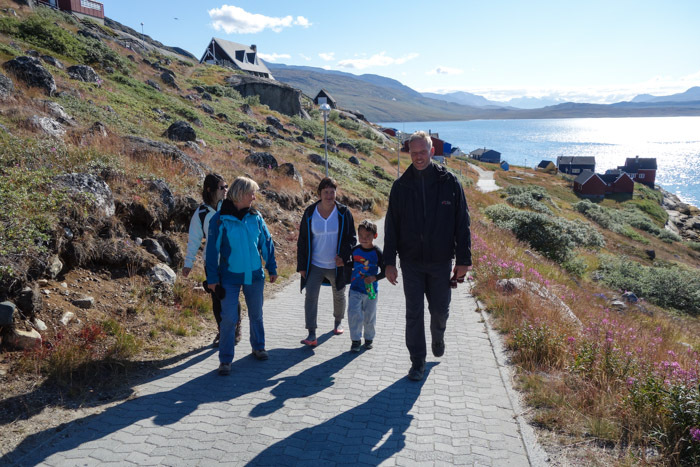 Getting ready for Kapisillit and the Nuuk fjord! Jon our guide started the day off by warning our group of six that we were going to be cold. It was hard to believe since I was already wearing two layers of thermals and an anorak, plus rain pants over my normal pants. That wasn’t enough, though, so he gave us some bright orange survival suits to put on top. I felt like a big ball of too much orange, and couldn’t really move – but I definitely felt warmer and safer in them! Feeling very safe under all the survival gear! 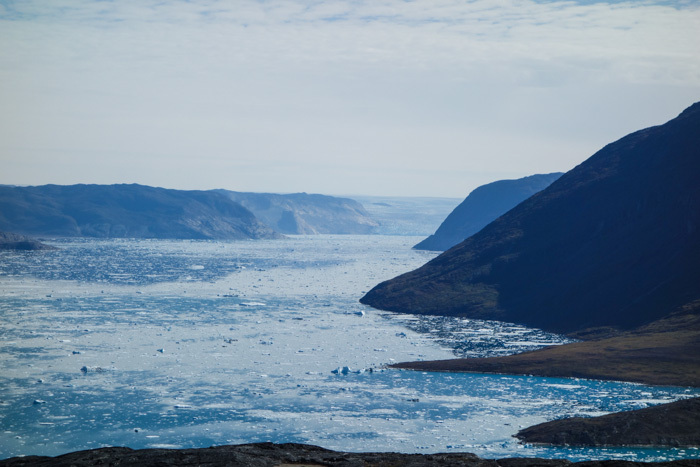 Our end game was to see the ice fjord near Kapisillit, a relatively large settlement two-hours sail away from Nuuk. Once close, we would hike up a long hill to a sight-seeing point. This was to be our first time viewing the inland ice! 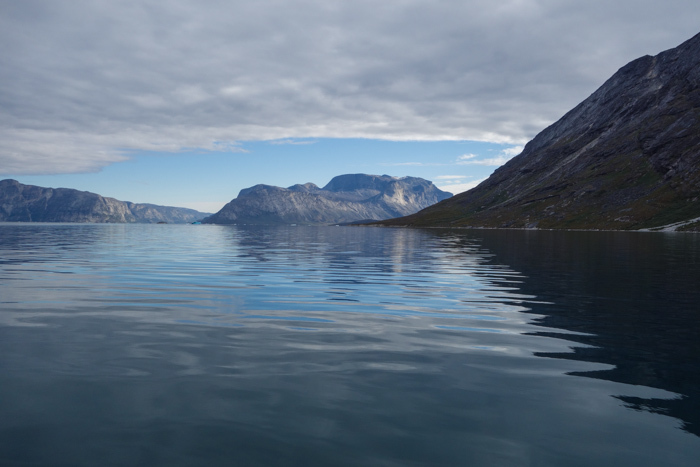 We sailed in a Poca 550, which is the most common type of boat in Greenland. It’s a simple but sturdy open-boat, meaning that you are exposed to the elements, but also closer to the stunning nature. The water was a silky hue of green, blue and purple. 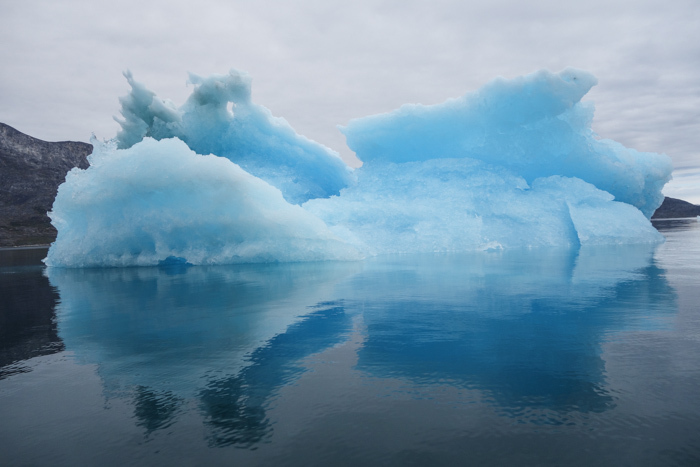 Icebergs are so much cooler in real life! 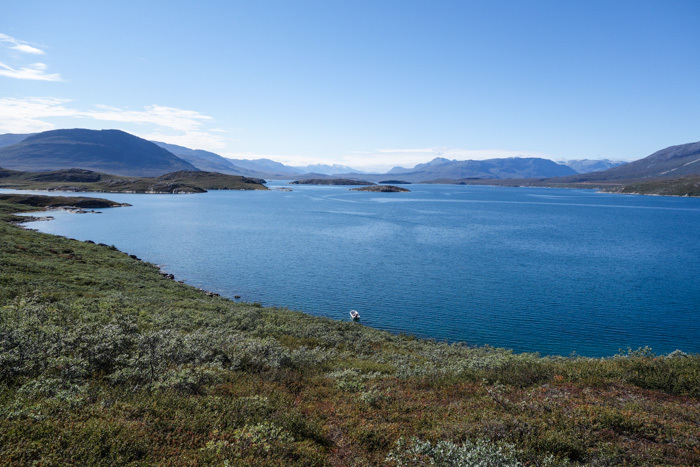 Once you leave Nuuk area, the blue skies start to appear…. Two hours after we reached an area near Kapisillit where we would begin our hike. We started stripping off our many layers. Apparently Nuuk is the cloudiest area in the fjord system, but if you get away from there the sun is nearly always shining. This image reminded me of the melted wicked witch from the Wizard of Oz. Definitely not ruby slippers! 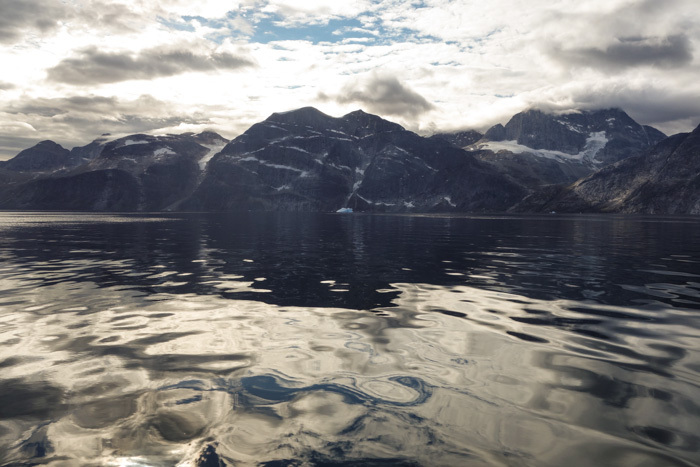 You could smell the arctic summer everywhere. Heady scents from herbs and flowers dominated our senses. Everywhere you looked berries were growing on the hearth – mainly crowberries, but also an abundance of juicy plump blueberries…. they were delicious! Half way up to the view point – you can see our little boat near the shore! Jon told us that people use the herbs in the nature for tea and pot-pourri. The fragrance was infused into our senses. 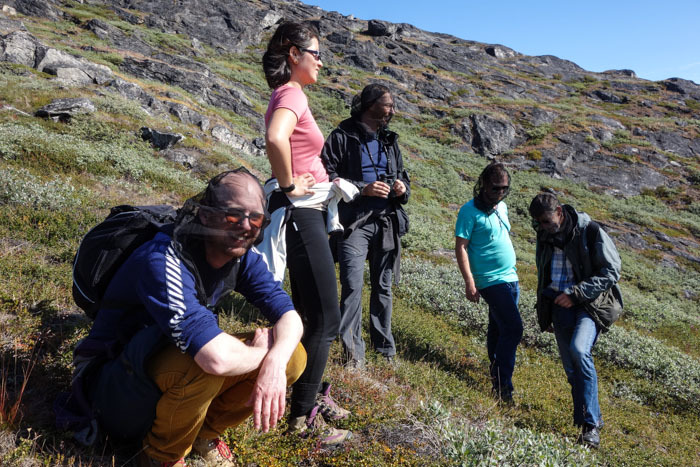 Summer in the arctic means a plethora of mosquitoes. Luckily Jon came ready with mosquito nets, which all the men thought they needed. And then we climbed up about 50 minutes to see the view. And what a view! If you look into the depths of the picture below, you will see the beginning of the ice cap. 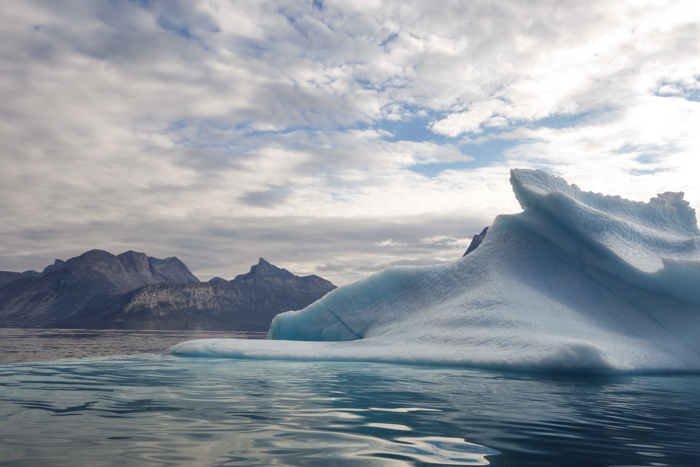 As I was looking into the distance, I noticed a dark little dot slipped off an iceberg. It was my first seal spotting. 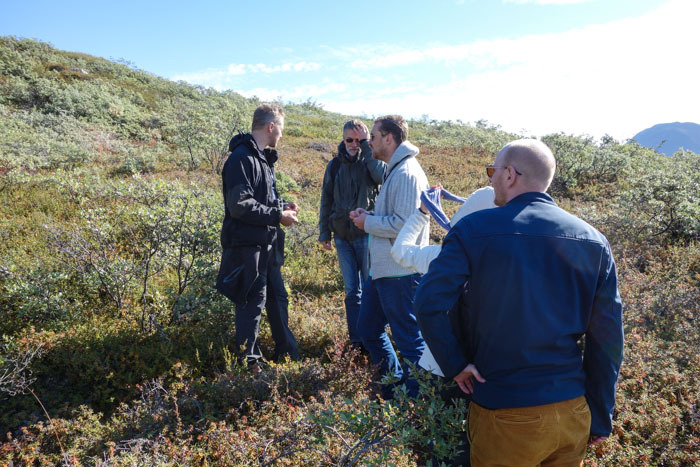 The next stop was the settlement Kapisillit, where our local hosts Kristine and Karl invited us over to have a kaffemik. 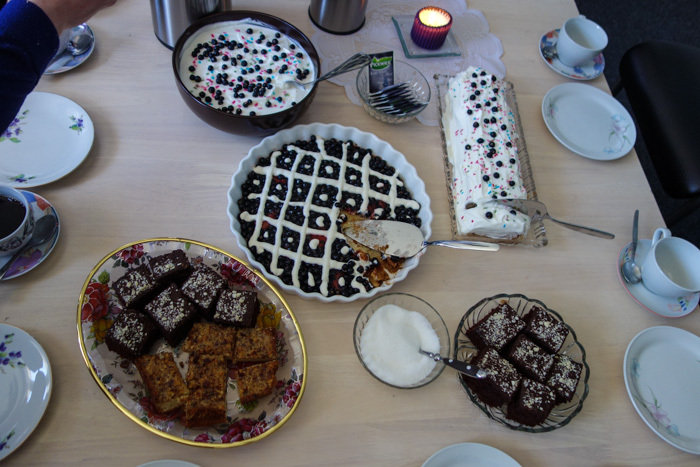 We filled our bellies with blueberries and popular Greenlandic style cakes. 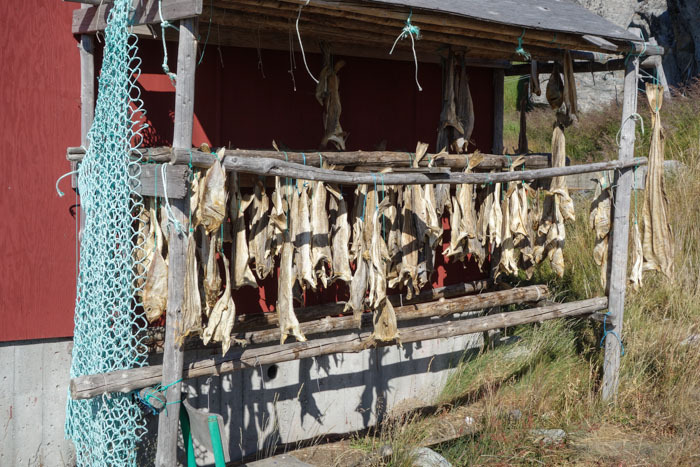 Kapisillit is a hunting and fishing community in the Nuuk Fjord, about 75 kilometres away from the capital. Kristine has lived in Kapisillit her whole life, but in October she is moving to Nuuk to study. Karl is the teacher at the local primary school. He currently teaches three students. 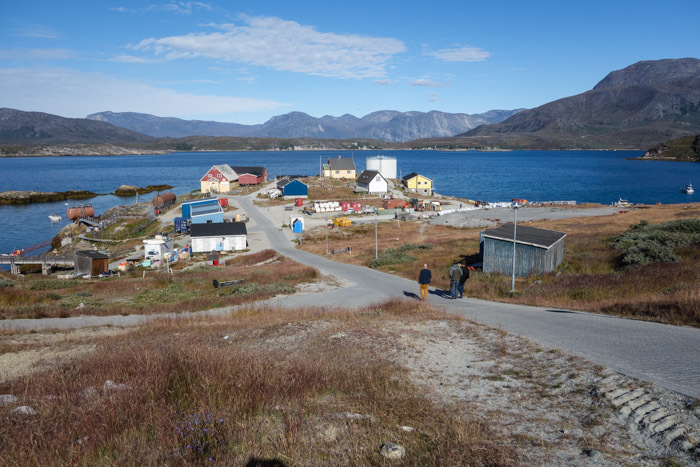 When children turn eleven, they need to move to Nuuk to continue school. It can’t be easy to leave your parents at such a young age! With our bellies full of cream and berries, we headed home with a sugar-high. It was then time to head home. On the way back we tried a new type of surfing – on an open boat! (Perhaps it was to balance out the boat a bit, but it was sooooo fun). 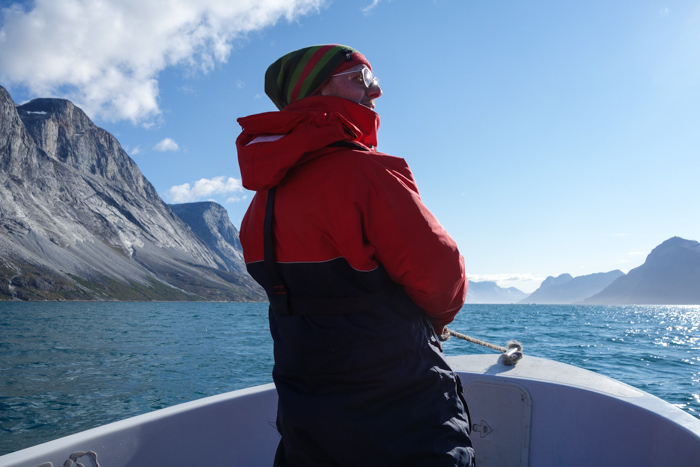 This sailing trip was with Touring Greenland, one of the two main touring providers in Nuuk. Postscript: Thanks to Jonas’ parents for lending us their little handy camera too! 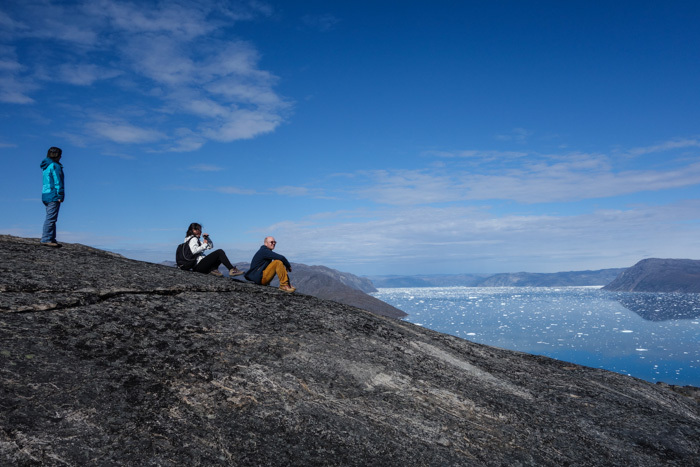 Marianne and Carsten came to Greenland for a two and a half week visit, so we planned a few adventures into the nature. This included hiking up the mountains, visiting the whale graveyard, spotting whales and gorgeous icebergs. Besides that, it was just lots of relaxing time in the city and cafes! Dear Abel, Thank you for your very kind words, it is so nice to hear that someone is enjoying my blog =). Unknowingly, we probably crossed paths walking on the main street in Nuuk, smiled at each other and then walked on. At least, I try to acknowledge everyone I go past! I am interested to know how your point of view is different, yet the same. Where do the differences lie most dramatically, in your opinion? Do you write a blog too? =) Please share the link =). I especially loved your blog about the eyebrows and nodding thing. It still makes me smile and giggle. 😀 Greenlanders in Denmark does the same. No need to mention if they know each other or not. Love it! I love the traditional kaffemiks, mattak and all the other traditional cuisine, christmas and the way of living in and with the nature. That’s juat a part of my pedigree. I come to Nuuk for the nature and the adventures, and everytime I get there I get blown away of the nature and it’s beauty. I remember from my childhood when tourists always asked us if we were proud of our country, and the only thing we could think of was that we probably were, but then again, it’s home and we’re used to our surroundings. Today, I absolutely understand their point of view, because I used to take the nature and environment for granted. This alone is why I rather go out sailing than staying in town for the precious few week I stay there. First I must apologise for the late reply. I have been in Ilulissat and with only my telephone data to help me online I admit I’ve been conserving it. I am glad you liked the post about body language in Greenland, lots of people seemed to! The air flight magazine Suluk now has a (perhaps inspired!!) piece on this precisely this topic! Feeling like a stranger in your original home sounds very familiar. I think it’s because my parents said very much the same thing, just of a different place. It makes me wonder how many people feel displaced in this world at one point or another. It’s not necessarily a bad thing, it’s just an outcome of migration and cultural difference. I wonder if I will ever feel like I fully belong somewhere in this world, because I don’t think I will even feel ‘native’ back in my own home. Life changes you. I have read your blog and will be keeping in touch. Sounds so nice with all the cycling! PS you are right to be proud of your country it is truly stunning! The landscape is simply stunning, really hope one day I will make it to Greenland. I’m blown away by your photos. Just. Stunning. Thank you! It’s just the nature here… I still hold my breath sometimes!